December 2014 - Website of kennetaccordionorchestra! As another year draws to a close, the orchestra will be looking forward to a festive break after a busy end to 2014. Following some intensive practice, on 1st November the orchestra participated in the Southern Area Accordion Championships in Wimborne. The players performed excellently with the orchestra achieving 90% in both the Open Band and Advanced orchestra sections - with performances of 'Band of Brothers', 'The Gael', 'The Best of Abba' and 'Rhapsodia Andalusia'. Members of the orchestra also took part in a number of solo, duet and small group sections throughout the day. Veronica Bullard and Helen Newton achieved first place in 'accordion with another instrument' - with Veronica playing her flute in Berceuse, Op56 no.1 by Faure (from the Dolly Suite and arranged by Nigel). A fine solo performance by Richard Brunning, duets from Nigel and Helen and also the Kennet Accordion Group topped off a successful and enjoyable day. Later in November, our orchestra leader David Hall married his partner Tracy, at St. Mary's Church, Bibury, in the Cotswolds. The orchestra were honoured to be asked to perform during the ceremony. The bride had requested two pieces to be played during the signing of the register - 'Gabriel's Oboe' and 'A Whiter Shade of Pale'. 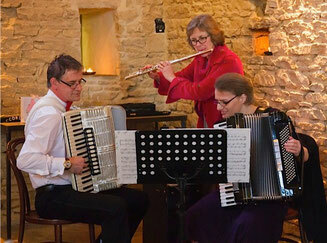 Back at Cripps Barn for the Wedding Breakfast, Nigel, Helen and Veronica played background music whilst the guests were arriving and enjoying their canapes. A really special day was enjoyed by all. The arrival of the festive season signalled our regular joint concerts with the Kennet Singers. The main theme for this year was to commemorate 100 years since the outbreak of the First World War. After 28 years of concerts and fundraising, this was also to be the last concerts for the singers, which alongside the poignant theme, resulted in this being very special and sometimes emotional evenings. The orchestra has decided to continue the tradition of a Christmas concert on the first Saturday in December and have invited the singers to join us as guests. We will keep you updated of plans for 2015. Our last engagement of the year included seasonal tunes and carols with the residents of the new Redwood House complex in Hungerford. Lots of mince pies and cups of tea were enjoyed by the audience and players alike! It was a thoroughly enjoyable evening and we are delighted to have been invited to perform again next year. After the Christmas break the orchestra will start preparing for some exciting engagements we have planned for 2015. Details will be shared on the website in the New Year. Thank you to all of you who have supported the orchestra during 2014 and we would like to wish you all a very Merry Christmas and Happy New Year - we look forward to seeing you in 2015.